The WELL Building Standard is revolutionising the way people think about buildings, it covers seven core concepts of health and explores how design can be optimised to advance human health and well-being.BVN in conjunction with Wilkhahn led the design of the 500m² fitout of a warehouse-style building on Wentworth Avenue in Surry Hills. The driver for seeking this certification was around Wilkhahn’s value of creating healthy environments and holistic workplaces. The adaptive reuse of the warehouse building has also made a significant impact on the sustainability and rebirth of a precinct in Sydney with a rich history. Since the showroom has been built, other businesses have followed suit revitalising the area. “Turning an early twentieth-century space that has been primarily used for industrial activities into a twenty-first-century space to not only display furniture and plants but also host talks, films and events about design required a focus on space and light. Natural light is particularly important in this space which is long and narrow and has an opening on one side” said Ms Sally Campbell, Senior Practice Director at BVN. An abundance of natural light and views to the outside and across the entire floor plate. Large trees and dense planting in the atrium greenhouse space and potted plants throughout the showroom that improve air quality and create a connection to nature. Subtle active design to facilitate a healthier environment including promenade spaces designed to encourage interaction between staff and visitors. 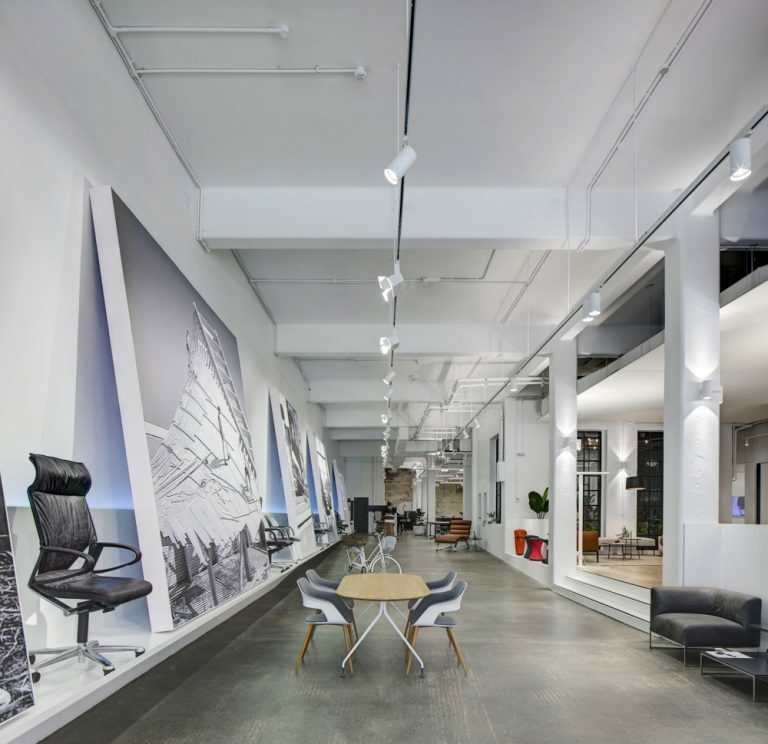 Spatial volumes that vary in scale, from a large flexible forum space suitable to host design events and product display scenarios that simulate client requirements, through to a small internal courtyard atrium. Zones of dynamic, loud, quiet and retreat give employees greater choice in where they work. Active and louder areas follow the promenade backbone from the entry, through to the rear of the floor plate. Moving away from the promenade circulation zone, areas of retreat and quiet gradually increase. The spatial variety is further demarked using different sizes of enclosed rooms, soft furnishings, and study nooks. Sit to stand desks for employees. Raised wooden floors that articulate a distinct work zone and add warmth to a space that is predominantly raw concrete and brick. 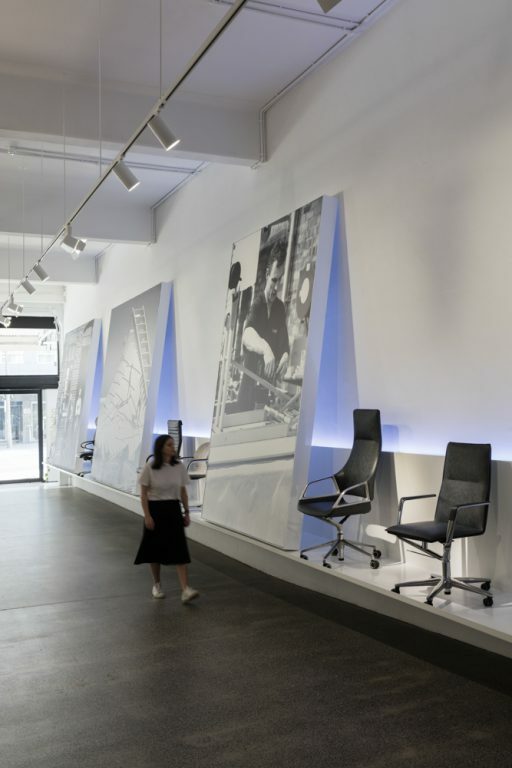 Wilkhahn’s commitment to wellness is also demonstrated in additional activities such as an ‘office for motion study’ that informs how the design of their products impacts human health and wellbeing.